La Mustique No 5 - Ballito Central Accommodation. Please note: All correspondence will only be done via e-mail. Ballito - a Mediterranean style sea side town. Restaurants and abundant shops and magnificent beaches are within walking distance. Only 30 minutes north of Durban is Ballito the heart of the Dolphin coast the playground of dolphins and whales and to the holiday makers who come to watch them with a subtropical climate. Conducive to all year round holidays. Watch dolphins and whales frolic in the water - sleep to the sound of crashing waves - wake up watching the glowing sun peeping over the horizon. 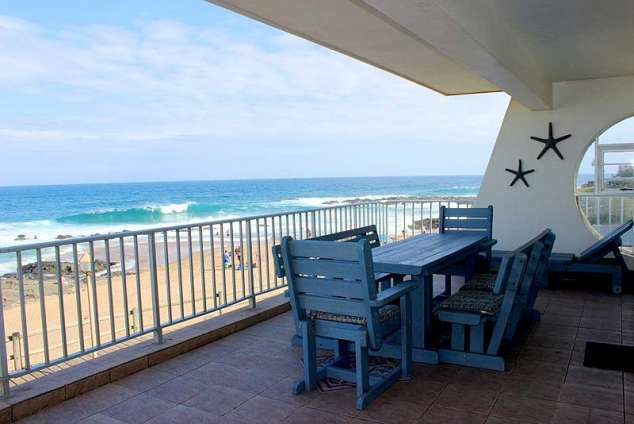 La Mustique central to the CBD on the 5km shoreline promenade in Ballito is a much sought after up-market private and secure complex due to its perfect holiday location. Has magnificent un-interrupted beach sea views. Located on the beach front with no road crossings with direct access to the promenade which is ideal for lazy strolls along the beach, swimming beaches and directly in front of the well-known very popular 'Granny's Pool' that is safe for children to swim. This first floor apartment has 3 bedrooms 2 bathrooms, open plan kitchen, living room and dining room, opening directly on the large balcony a superb mix of indoor and outdoor living on your holiday. Direct beach access and secure fenced swimming pool and additional braai with lapa in the well - maintained and sizeable garden. Open plan kitchen, dining room and lounge and main bedroom opening on to the huge patio where you have magnificent beach and sea views that offer the perfect tranquil setting to laze of in style and comfort. A fully equipped kitchen with microwave, oven, hob, and fridge/freezer washing machine / tumble dryer and dishwasher, toaster, kettle, crockery and cutlery. Dining room table with seating for 6 guests. Beautifully furnished lounge with Flat screen Television, DVD and DSTV decoder full DSTV bouquet. Mnet, kyknet, Movie Magic 1 and 2 all SABC channels, Super Sport 123 and 4. All Disney and Cartoon network and a few others. The main bedroom has a queen size bed which opens onto the large balcony stunning sea - view with ensuite consisting of Shower, vanity and toilet. The second bedroom has a queen size bed and third bedroom two single beds both bedrooms with sea - view share the second Bathroom consisting of Bath, vanity and toilet. Air conditioner in living rooms and main bedroom / ceiling fans in all bedrooms. High quality Percale linen and Duvets throughout. It is necessary to bring own bath and beach towels. A beautiful fenced swimming pool and additional braai and Lapa entertainment area in the complex for use by residents. Secured parking for vehicles. Lock up-garage is for owners private use only. 63965 page views since 11 Jan, 2013.